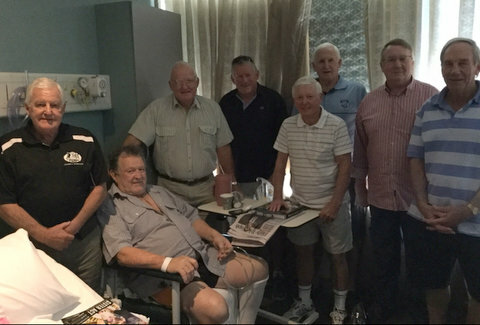 Northern Sydney Welfare Officer Ken Vessey had the pleasure to accompany ex Western Suburb “Magpies” greats Noel Kelly, John “Chow” Hayes, Barry Glasgow, Tim Murphy, Pat Thomas, Carl Ross and Geoff Squires to met John “Snoozer” Elford (Men of League Member 2407) , their former team mate from Wests teams in the 1960 -70’s. 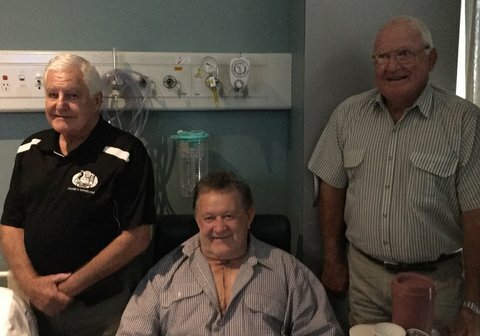 John was recovering well at the Prince of Wales Hospital,Randwick from recent aorta surgery and to say John was surprised when his old mates walked in his room is a huge understatement. In no time at all they were asking John how we was going and lots of banter in the room about the old days. Chow Hayes, Geoff Squires and Tim Murphy. 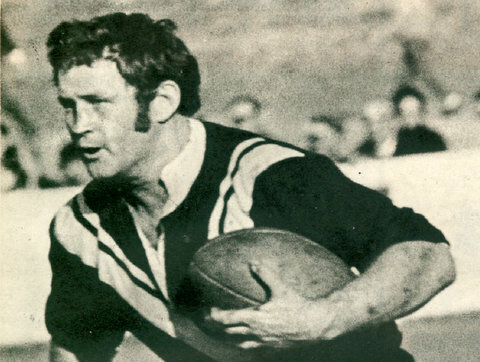 John was born in 1947 at Kempsey,was the youngest of 6 children, grew up in Frederickton NSW and played his junior league in Kempsey and with the Smithtown Tigers RL Club .He played under 18 yrs old for the Tigers when he was 13 yrs old in the 2nd row but played on the wing when in in reserve grade and was only 16 yrs old in 1963 when he played 1st grade.He recalls two outstanding Captain Coaches of his , Frank Stanmore and Horrie Toole. As a youngster John was a beach sprint champion and obviously that is where he acquired his speed and strength that would secure his outstanding career in rugby league. 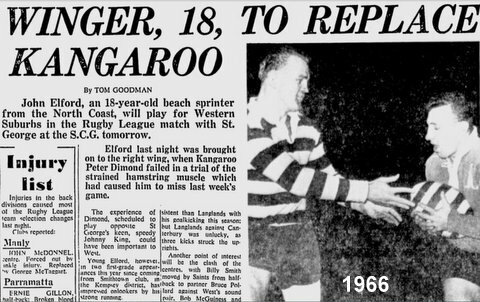 Noel Kelly reminisced when he as Captain Coach of Wests in 1965 he travelled up to South West Rocks, NSW with Billy Owens (a Magpie legend) to see and met a “red hot” 17 yr old player .Noel promptly told young John to “get down to Pratten Park next year” and recalled promising his Mum “he will be looked after by Wests”.Noel proudly boasts that it was him who gave John his nickname of “Snoozer”. 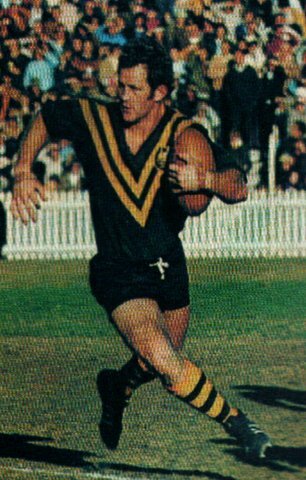 It is history now that John arrived at the Club for the 1966 season and stayed there until 1976, playing 132 x 1st grade games and 42 x reserve grade games and was issued with the Western Suburbs 1st grade players medal number 628. John gets the call up to play First Grade. Carl Ross, John Elford and Noel Kelly. 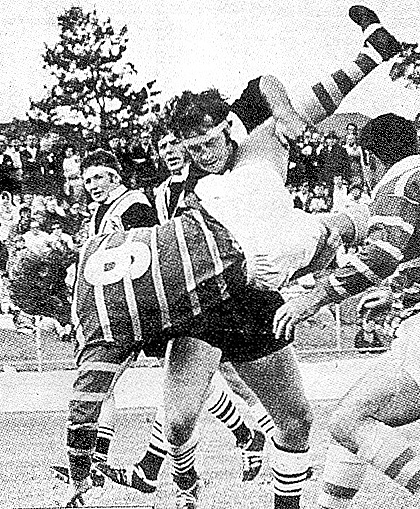 Playing many on the wing he quickly gained 1st grade selection and became known for his speed,strong running,fearsome defence and ball playing skills and in 1971 he played his first game in the 2nd row ,remaining there for the balance of his Wests career. .In 1972 he had his finest year gaining selection in the NSW team, played 2 tests in the Australian Test team against the touring New Zealand side plus gained selection in the touring Australian World Cup squad but unfortunately during a qualifying match in France he broke his arm for the first time.Regrettably he suffered arm breakages on another two occasions ,which lead to is premature retirement from Sydney grade rugby league. John was selected in the Wests Club Team of the Sixties and was bestowed with Life Membership of the Club. John in the Green and Gold. Being a country lad, John returned home and during 1977-1979 he was a successful Captain Coach with his old Smithtown Tigers Club before further arm/hand injuries in 1979 , forced his permanent retirement from the game he loved so much. John resides with his lovely partner Vicki at South West Rocks, where he is a successful oyster farmer and his oysters are well known as the “best money can buy”. John was presented with a Men of League polo shirt / cap for his contributions to rugby league, bringing so much delight to thousands of the Wests Magpies faithful during his playing career and wished him a speedy recovery. John expressed his appreciation for the gifts and kind thoughts. By Ken Vessey,Welfare Coordinator Northern Sydney Committee. NOTE: Ken from all of us at PPM we thank you for your brilliant work on this occasion and the many other visits that the Northern Sydney MOL welfare team organize through out the year.